Come and meet Croissant, Streusel, Sponge and Filo! The Kirk’s dik-dik are one of the smallest antelopes in the world and have been named by their keepers after delicacies originating from the countries they previously resided in. Their eyes, which are surprisingly large in relation to their size, provide more than just sight. Preorbital glands appear as a black spot below the inside corner of each of their eyes and these glands produce a dark, sticky secretion used to scent-mark their territories. Dik-diks have also evolved a cooling mechanism within their snouts that stops them from overheating, even in extreme temperatures of up to 37° C. This also helps minimise their need for water. 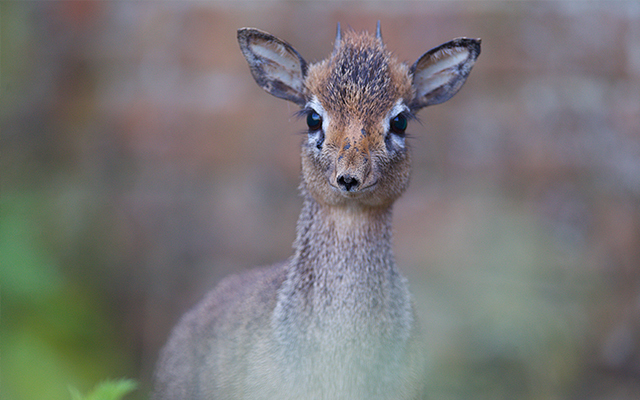 Kirk’s dik-diks occur in eastern and southern Africa and the unusual name for the species is derived from their call. If they are discovered by a predator they run in swift, zigzag like patterns until they reach refuge. It is during this flight that they emit trumpet-like ‘zik-zik’ calls to raise an alarm or harass predators and publicise the presence of a mated pair. When fully-grown dik-diks grow to an average height of 40cm and usually weigh between 4-5kg. The species is not currently close to meeting any threshold for threatened status. It remains widespread and locally common throughout much of its historical distribution, and is present in a number of protected areas.